I just finished painting my desk and re-vamping my inspiration board. Picture of the entire Studio…still to come, but here’s a peek at the finished desk! Remember how it looked before? And, now…After! I big time heart this desk! It has such great lines. Remember my DIY inspiration board? 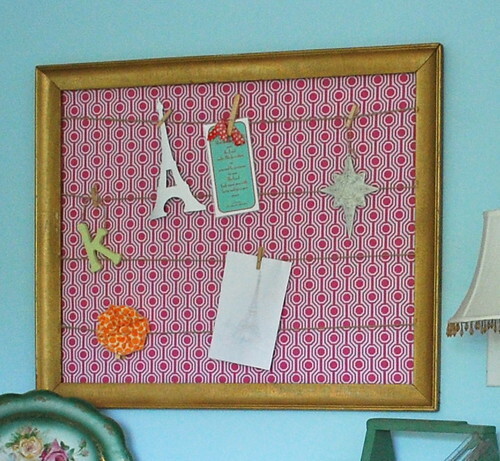 See the How To and then I just stapled a piece of fabric to the back of the frame…that’s it! I was trying to find plate hangers to hang that plate on the wall. I bought it at an auction for a whopping $25. I know…crazy! It has never seen a wall…it’s mostly been in a cabinet hiding out. 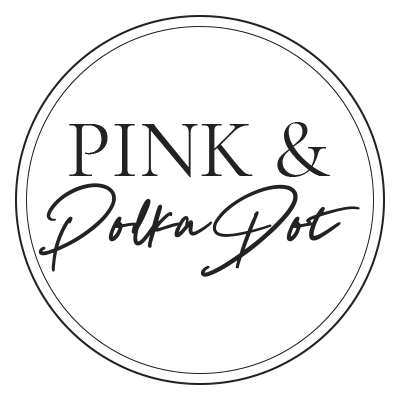 I just thought there was too much pink in the plate…to put out in our home, but my studio is the place where I can do too much pink! So, out it came. I’ll have to make a run to Dollar Tree today for some plate hangers. 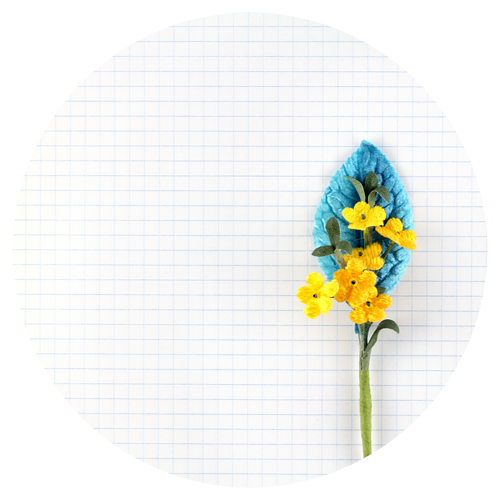 Do you have a space to create…even if it’s a corner? It’s your corner or your desk! I think I’ll do a linky party next week where everyone can post their spaces! Let’s inspire each other to create! The desk is so sweet. I really like your inspiration board idea. I live in an apartment right now and my art supplies fit in a 2 door cabinet and my little dining nook doubles as my art space and work table. it works for now. The linky party would be fun. I like seeing others creative spaces. That desk looks great -it totally freshens up the room! I love paint- I just repainted a piece myself, and I wonder why it took me so long to get around to it! The desk turned out gorgeous! What great lines. I love the desk!! It's beautiful!! Can't wait to see pics of the space. 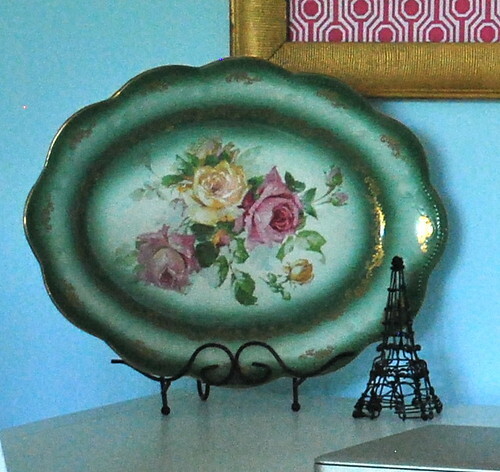 The plate is pretty and will look perfect on your wall. I like the adhesive hangers that aren't visible when hanging plates. 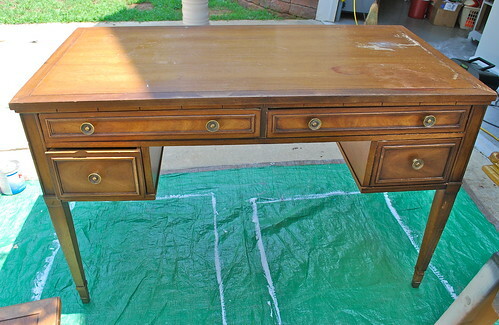 I could tell from the before that the desk was going to look great. 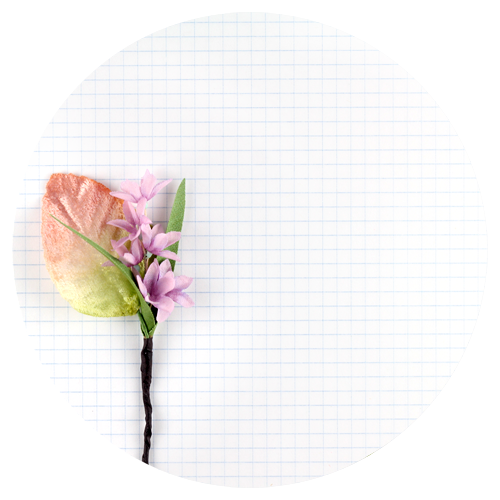 Love your space, so feminine. I love the desk too. Looks great in white! I so need to make it a priority to get my creative space together. I want to be able to keep my sewing machine out for when I need to stitch something. What happens is I don't want to drag it down stairs and set it up so I put the project aside! What a great space. 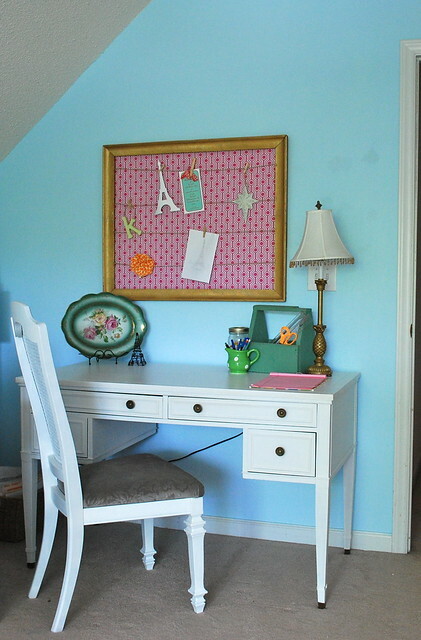 I love the desk and that bulletin board is so cute – great fabric! I think your linky party sounds so fun! So sweet! I adore floral plates like yours. And I just have to make that inspiration board!!! Wow! It looks awesome! Can't wait to see the rest of the room. so cute! i love that frame. this looks amazing! I love the wall color and how the white just pops! I just did most of my new son's vintage nursery but will be returning soon with new pictures in better lighting. It has been fun but I'm so ready to be done with it. 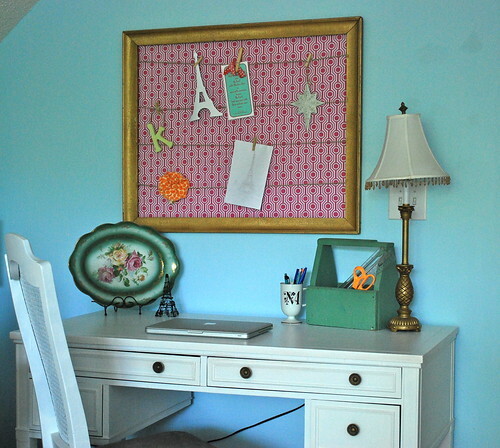 Next, I have to share my bedroom makeover when I get my frames purchased from Goodwill and glittered. Love the desk… very cute! I have that same chair!! It looks great! this turned out so dang cute! job well done! Hello! I just discovered your blog after searching images for “desk before and after” and having my jaw nearly drop to the floor seeing that you painted the exact same desk that I am planning to paint! I love the lines of it too! And I really did not think the knobs on this one (mine is missing one) were original as the base around it looks like a larger knob used to live there and the holes are not centered…but apparently they are! I think it's a Drexel desk from the '60s. I am absolutely new to painting furniture…can you share the brief highlights of what products/process you used on this one? I am planning on a slightly off-white color. Thanks!